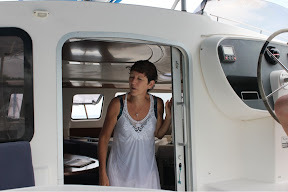 We are at sea. 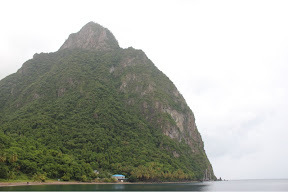 We awoke this morning under the Pitons and by 7AM I was in the water enjoying the clear water and an abundance of fish while the captain of the ship went into Soufriere to clear immigration and customs. Chris joined me a short while later and we had a great hour and a half of some really fantastic snorkeling and searching the beach for sea glass. It was a romantic and beautiful morning. 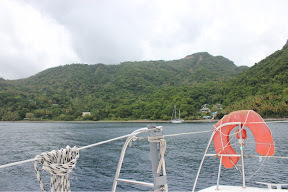 And then, about 9:30 we departed our mooring for Bequia, which is the St Vincent part of the Grenadines. 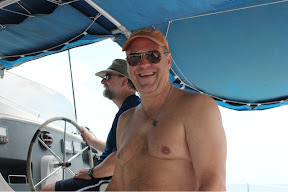 We hope to make Bequia by late afternoon and then the fun part of the sailing adventure will begin. Sadly, I was so intent on getting into the water this morning that I forgot my camera. The abundance of fishes was special as well as some unique fish that I do not normally get to see such as squirrel fish, drum fish, a number of trumpet fish, spotted trunk fish, and a lot of small eels foraging along the bottom amend the rocks. 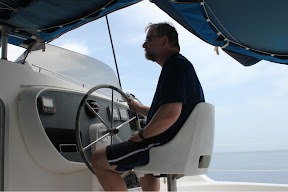 We are at sea as I write this--enjoying a relaxing, albeit slow sail south. But St Lucia is still in sight even though our course is firmly set south and the heading is 185 degrees with light winds. The beauty of the Pitons is behind us and unimagined adventures await us ahead.